This month has proved very fruitful for the Supreme Council of Antiquities (SCA). Three of its excavation missions, in Isamilia, Bahariya Oasis and Fayoum have all uncovered distinguished Roman treasures that reveal more about the fabric of this significant era in Egyptian history. An SCA archaeological team working in the area of Tel Al-Maskhouta in Ismailia found the 19th-Dynasty mud-brick tomb of the overseer of royal records, Ken-Amun. Nearby they found 35 Roman tombs and an ancient limestone stela dating from the reign of an unidentified 19th-Dynasty Pharaoh. "It is a very important discovery for ancient Egyptian history," Zahi Hawass, secretary-general of the SCA, told Al-Ahram Weekly. The tomb consists of a rectangular room with a domed stone ceiling and a deep squared shaft. 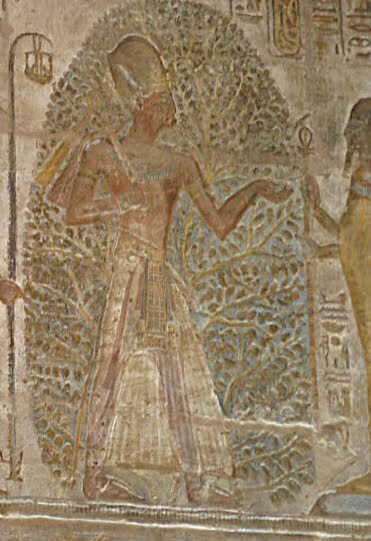 The walls are decorated with scenes depicting the tomb owner in various positions with his family and before the gods, as well as the titles of the deceased and the name of his wife, Isis, who was, it is written, a singer to the god Atum. Some of the decorations are in sunken relief and show religious and funerary scenes. The most interesting are the ones that display mourning women and the lines of Chapter 125 of the Book of the Dead that concerns the questioning of the deceased. A depiction of the goddess Hathor in the shape of a cow emerging from the Nile Delta marshes, and the four sons of the god Horus, are also visible. Inside the shaft the team found a large limestone sarcophagus of the tomb owner engraved with inscriptions on its inner and outer surfaces. When experts open a mummy coffin Friday evening, April 30, at Pyramid Hill Sculpture Park, they don’t expect to find someone wrapped in bandages from head to toe. What they do hope to find are hieroglyphics or other clues that might tell more about the life and death of Ankh-Takelot, a high official and blood relative of the Egyptian pharaoh, dating from 944 to 732 B.C. The opening will take place at 6:30 p.m. at the park’s ancient sculpture museum, with the event being by invitation only, said Richard Batdorf, an office manager at the park. This is the first time Pyramid Hill has opened a mummy coffin, he added. This one, which is 3,000 years old, is part of the private collection of Pyramid Hill’s founder, Harry Wilks, who bought it at auction. It has been on display since 2009. To expand audiences for cultural attractions in grim economic times, why not bring out a corpse or two, preferably from ancient Egypt? “People who are not necessarily interested in going to museums are all very interested in this,” said Silvia Cubiñá, the executive director of the Bass Museum of Art in Miami Beach, which will unveil two mummies in a new Egyptian gallery on Friday. One, swaddled in crisscrossing fabric, had long been in the museum’s storerooms, and when a local collector found out that it would go on view, he donated another with its coffin, in the shape of a longhaired youth wearing necklaces. Half a dozen institutions this spring are also bringing out the dead, and marketing them with catchy phrases. “Very Postmortem” is the title of a display of Irethorrou, a 2,500-year-old priest, at the Legion of Honor museum in San Francisco (on view through Halloween, of course). On Wednesday the long-term installation “The Mummy Chamber” opens at the Brooklyn Museum, and the Bass Museum has set up a “mummy hotline” (786-343-6341) for show information. Curators are enlivening the galleries with scientific discoveries: computer screens display CT scans of the skeletons. Slideshow of the new Egyptian gallery at the Bass Museum of Art in Miami. Hawass talking about opening the exhibition in New York. There's nothing archaeological in this - it is mainly about meeting celebrtities - but there are links to some of the better coverage of the exhibition and the opening, including the one posted recently by Stan Parchin. Readers will remember Ray Johnson speaking about this in his lecture so today I went and visited. Firstly you have to get an idea of this blockyard, it is huge, big and then big. This is a view taken from the mosque and you can see how much there is there. It is all arranged on mastabas (local name for brick benches). When you get to the end of the temple exit on the north side and there is a walkway with a chain link fence. Just follow it. Everything is well labeled and stretches from Middle Kingdom to Islam. This is too long to translate. Google Translate somewhat mangles it but may give the gist. LONDON - The Science Museum will stage an Egyptian style makeup workshop at its next Lates evening on Wednesday 28 April. The workshop is one of the highlights of the programme, which celebrates the science of beauty through a series of fun and interactive workshops, talks and other activities. Visitors will also have an opportunity to view rare and beautiful items from the Wellcome collection of personal care – showing how beauty accessories and techniques have changed throughout history. A media preview of “The Conservator’s Art: Preserving Egypt’s Past,” a new exhibit opening Thursday, April 29, at the Phoebe Apperson Hearst Museum of Anthropology at the University of California, Berkeley. The exhibit features exceptional artifacts from the Hearst Museum’s vast Egyptian collection – including crocodile mummies, mummy portraits, statuary, amulets and unusual “reserve heads” used in Egyptian burial practices. The exhibit examines how technology and the humanities work together to enhance the conservation and understanding of ancient objects. It also aims to demystify the work of archaeologists and conservators, and to promote a dialogue with the public about their work and how museums help preserve cultural heritage. The Phoebe Hearst Museum of Anthropology at UC Berkeley will display rare artifacts from its vast Egyptian collection in a fascinating exhibition that will explore the conservation of our cultural past. We are pleased to announce this highly anticipated look into how museums blend technology and the humanities to conserve and understand ancient objects. Included are crocodile mummies that recently underwent CT scans at Stanford Medical School as well as statuary, mummy portraits, amulets, and one of only 30 known "reserve heads" used in Egyptian burial practices. Of the 3.8 million objects in the Hearst’s collection, the Egyptian artifacts represent some of the most important. Hawass also announced that a set of four foundation deposits — similar to time capsules — and a limestone fragment with a text indicating a tomb was hidden nearby were recently discovered in the Valley of the Kings. He said this discovery gave him hope he would soon find the tombs of Ankhesamun, Tut's wife, and that of Nefertiti, his stepmother. Conference: The Signs of Which Times? I'll see you there if you are attending. According to Hawass, who worked with National Geographic to engineer both displays, the twin Tuts have already pulled in a hundred million dollars — much of which is destined for the construction of a new Tut museum in Cairo. I met with Hawass in the darkened Times Square venue to talk about the exhibition, the scientific discoveries since the Met appearance, and his spectacle-seeking brand of Egyptology. Andrew Erskine (ed. ), A Companion to Ancient History. Blackwell Companions to the Ancient World. Chichester/Malden, MA: Wiley-Blackwell, 2009. Andrew Erskine is not new to the task of editing a Companion,1 but the aims of the volume under review are somewhat different from those of his earlier achievement. In this preface, he states that this work "aims to provide a series of accessible introductions to key topics in the study of Ancient History ...", which it certainly accomplishes, while its second purpose, namely to "reflect the vitality and the excitement of scholarship at the front line" is only partially fulfilled. The volume is arranged into eight thematic sections to which 49 authors contributed. These are for the most part well-known scholars who can write comfortably about both the Greek and Roman aspects of specific themes, which is indeed no easy task. Examples are E. Meyer with her introductory but rock solid chapter on law or Lisa Nevett on housing, although her pages read as if they had been too often revised. Other specialists in more technical fields, in particular Walter Scheidel on demography, contribute by sharing their unmatched expertise. Forewords by five international scholars precede these sections and among them figures that of the late Peter Derow, one of the dedicatees of the volume, together with George Forrest. The editor asked them to offer their personal perspectives on ancient history, in other words to answer the question that we have all been asked at some point: why it matters. With an exerpt from the book following the review. Cleopatra was a tragic temptress who left a string of broken hearts up and down the Nile -- or at least, that's what her enemies in Rome wanted you to think. Now, a new biography of the Egyptian queen aims to set the record straight. Historian Duane Roller is the author of Cleopatra: A Biography, and he tells NPR's Guy Raz that the most popular images of Cleopatra came from a smear campaign waged by Rome. "You have to remember, the information that we have about her was written by the people who defeated her -- her enemies," Roller says. "They saw her as a dangerous threat to the Roman Republic and [built] her up as this horrible woman who led men to their doom." In fact, Roller says, while Cleopatra did have relationships with both Julius Caesar and his deputy Mark Antony, they were the only men in her life. "They were the two most important people in Rome in their era," Roller says, "so her connection with them was not purely a matter of physicality, it was a political decision." As usual the last few days are of course the busiest – hence our silence on Tumblr! This week saw the confirmation that there is further material to investigate in T3 in one of the next seasons. We photographed our small and special finds from the season this week and completed our recording forms too. It has been a week of final ‘post-excavation’ plans and the seasonal act of covering the archaeological remains and ‘back-filling’ the trenches with sand – this is both to ensure that anything standing is not damaged by the environment, and also to ensure that future archaeologists know that someone has been excavating in certain areas in the 2000s! A quite remarkable discovery occurred earlier this week in the surface layers of T5 and this will be further investigated during the summer and published soon as well. Were they made by some weird kind of fault? Ancient astronauts? Did frail feet fell the Tutankhamun? This analysis references the JAMA and other reports, and looks particularly at the claims for Freiburg Kohler disease found in the Pharaoh's foot and the implications of this on his reign. Was King Tut a warrior king or “one sick kid”? Even as the Family of Tutankhamun Project was publishing its findings in the Journal of the American Medical Association that the Boy King was a frail young man who needed a cane to walk, Egyptologist W. Raymond Johnson was publishing his evidence that Tut was an active young man who rode chariots into battle. So which is the true Tut? What if both versions are accurate? Could this perfect storm of physical challenges and adventurous behavior have led Tutankhamun to a heroic but early grave? Two weeks ago I posted my article about the JAMA* report’s analysis of King Tut’s foot problems and how they might have potentially led to his downfall (no pun intended). One of the elements of my argument was that Tutankhamun was missing a toe bone in his right foot. But he wasn’t (and probably still isn’t). I had based my contention on a typo in one of the tables in the JAMA report, a typo that is contradicted in numerous places throughout the rest of the article, a series of dots which I somehow failed to connect. As a result, Gentle Reader Monica gently but concisely took me to task for my mistake in the Comments section of the article. Now a writer for a much more high-profile (at least for now) outfit than Em Hotep has made the same mistake. So shamey-shamey on us. But how did the same mistake make it past the editors of the Journal of the American Medical Association? It seemed like a pretty good thesis at the time: the combination of a painful foot condition in Tutankhamun’s left foot, a right foot weakened by a missing toe bone, and a brash young prince given to occasional risky behavior led to a traumatic fall and an untimely death. It’s still a pretty good thesis, for the most part. . . . . In another post on Em Hotep there is a round up of all the main responses to the JAMA article. So much for the evil god Set keeping his mouth shut—people just seem to insist on questioning authority. The JAMA article is jammed with answers, but queries continue. Assembled here for your pleasure and edification are the best examples of critical questioning culled from the Egyptological blogosphere. Tangled roots, the passed-over prince, aging them bones, lack of control, and Kate Phizackerley’s Quest for Accuracy. With photos and 2 minute preview video. The Giza Archives Project at the Museum of Fine Arts in Boston has for many years been the most extensive online resource on the archaeology of the Giza Plateau. Much of the archived material is from the 40 years of excavations carried out by Egyptologist George Reisner who led the the Harvard University-Boston MFA expedition at Giza from 1902 to 1942. Now the Giza Archives Project has moved into the virtual arena with the release of Giza 3D! However, this is not the first time the project has used 3D immersive technology to explore the possibilities of ‘Virtual Egyptology’. Many people have claimed that the pyramids were built by slaves, or even by aliens. In the past, it was difficult to convince the public that it was actually ordinary Egyptians who constructed these great monuments. With the discovery of the Cemetery of the Pyramid Builders, however, I was finally able to reveal the truth to people around the world. In my 1987 doctoral dissertation for the University of Pennsylvania, I predicted that we should look for the tombs of the workmen who built the pyramids in the area to the south of an ancient stone wall known as the Wall of the Crow (Heit El-Ghurob). This wall lies to the south of the Great Sphinx, and I theorized that it had been built to separate the area where the workmen lived and were buried from the royal necropolis that they had labored to construct. Earlier excavations south of the wall had found traces of the activities of workmen. Egyptian archeaologist Selim Hassan found architectural remains, along with a few potsherds and 4th Dynasty seal impressions, in the 1930's when he was helping the local villagers to find an alternative site for their cemetery. In the late 1980's my friend Mark Lehner and I excavated to the southeast of the wall. We found the remains of what we thought might be granaries, although we did not see any sign of tombs. We left the area without exploring further to concentrate on other things. Although we were beginning to see signs of the daily lives of the pyramid builders, the location of their tombs was still a mystery. In April of 1990, I was sitting in my office at Giza when a guard came to tell me that an American tourist had been thrown from her horse when the animal stumbled over the remains of a mud-brick wall. The guard took me and my assistant Mansour Boraik to the site - south of the Wall of the Crow, in an undeveloped area of desert only about thirty feet from where Mark and I had been digging a few years earlier. Ancient Egypt's later 18th Dynasty and its controversial personalities come alive in an expanded version of the compelling special exhibition Tutankhamun and the Golden Age of the Pharaohs at New York's Discovery Times Square Exposition (April 23, 2010-January 2, 2011)), a spacious venue well-suited for the grand layout of the show's more than 130 antiquities. The works on display end their seven-city United States tour with a nine-month stay in the heart of Manhattan. Upon their return to Cairo, the objects and some 5,000 other treasures from the pharaoh's tomb will await their state-of-the-art installation in the Grand Egyptian Museum near the Great Pyramid at Giza, set to open in 2013. After a brief video introduction, the exhibition opens up into 12 dramatically lit and thankfully carpeted galleries. Their contents are arranged chronologically and thematically. The show's first half is devoted to subjects such as: Egypt before Tutankhamun (r. 1332-1323 B.C. ); daily life; traditional beliefs; death, burial and the afterlife; and religious revolution during the reign of Pharaoh Akhenaten (r. 1353-1335 B.C. ), Tutankhamun's heretical father. A stark white transitional room runs archival film footage of the discovery of Tutankhamun's tomb, compliments of The New York Times. The exhibition continues with an exploration of the boy-king and his world, objects from his burial and recent scientific discoveries. Visitors to the first day of the boy king's new exhibit at the Discovery Times Square Exposition were wowed not only by the dazzling artifacts - but also by the eclectic souvenirs. From a nearly $9,000 Eye of Horus necklace to a 25-cent temporary tattoo, mummy fans were taking a piece of Tut home. "This is their favorite part of the exhibit," joked Paula White, 41, of Manhattan, who bought her daughter a golden King Tut crown as well as a tattoo for her son. Exhibit-goers were scooping up light blue amulet stones made in Egypt for a buck and Golden Age of the Pharaohs pencils for 99 cents. J. G. Manning, The Last Pharaohs: Egypt under the Ptolemies, 305-30 BC. Princeton/Oxford: Princeton University Press, 2010. In The last pharaohs, J. G. Manning attempts to bring Ptolemaic Egypt, and the economic policies of the Ptolemaic state, out of isolation from other fields of ancient Mediterranean history. Often seen as "a place apart," especially by classicists focused on Greece and Rome, Ptolemaic Egypt has entered historical conversations tangentially, as a stage for wider Roman policy, for instance, or as a counterpoint to classical, polis civilization. Here, Manning is reacting against the scholarly tendency to assess the Hellenistic experience from the perspective of Greece.1 Using a social science models, Manning suggests that Ptolemaic Egypt be seen as an intentionally constructed hybrid of Greek and Egyptian elements, wherein Ptolemaic policies encouraged a fertile interaction of cultures and ideas, an interaction that produced complex native and immigrant responses, ranging from rejection to acceptance. By examining the Ptolemaic state from an Egyptian perspective, Manning seizes an opportunity to rethink terms like "hellenization" and "Hellenistic" and demonstrate how, by adopting a native Egyptian, pharaonic mode of governance, the Ptolemies fit their institutions into long-term Egyptian history. As Manning puts it, "This book offers a new perspective on the connections between Greek and Egyptian civilization, by trying to understand Egyptian civilization in its own terms, examining the manner in which the Ptolemies established themselves within Egyptian traditions, and the dynamic interactions between the two cultures during Ptolemaic rule" (205). And such a new perspective is now possible, Manning argues, because of the material uncovered in the past 100 years.2 Because of its rich literary records, Ptolemaic Egypt is at present the only well-documented state of the ancient world that allows such a quantitative approach. The Question of Evil in Ancient Egypt by S.J. Mpay Kemboly, Golden House Publications. The book examines relevant sources from the Old Kingdom Pyramid Texts (c. 24th century B.C.E.) to the Graeco-Roman Period inscriptions (2nd century C.E.) in order to understand the way the ancient Egyptians tackled the question of the origin of evil in the world. It also investigates whether the world was perfect or imperfect since its beginning. Scholars addressing these questions are generally of two categories: those advocating the pre-existent character of evil and asserting therefore that the world was not perfect since its creation, and those who plead for the contingent nature of evil and thus imply that the world was created perfect at the beginning but was marred afterwards by various protagonists other than the creator. Heritage Key reported recently that mummified baboons in the British Museum could reveal the location of the land of Punt - a place to which pharaohs organized trading expeditions. To the Egyptians, Punt was a place of fragrances, giraffes, electrum and other exotic goods. It was sometimes referred to as Ta-netjer – 'God’s land' – a huge compliment given that the Ancient Egyptians tended to view outside cultures with disdain. Although Egyptians record voyaging to it until the end of the New Kingdom, 3,000 years ago, scholars do not know where Punt was. Ancient texts offer only vague allusions to its location and no 'Puntite' civilization has yet been discovered. Somalia, Ethiopia, Yemen and even Mozambique have all been offered as possible locations. Thanks to some cutting edge science, the search for Punt appears to be coming to an end. New research, to be presented at an Egyptology conference today, provides proof that it was located in Eritrea/East Ethiopia. Thanks to everyone who sent links for this story. Archaeologists unearthed 383 bronze coins dating back to King Ptolemy III who ruled Egypt in the 3rd century B.C. and was an ancestor of the famed Cleopatra, the Egyptian antiquities authority announced Thursday. The statement said one side of the coins were inscribed with hybrid Greek-Egyptian god Amun-Zeus, while the other side showed an eagle and the words Ptolemy and king in Greek. Founded by one of Alexander the Great's generals, the Ptolemaic Dynasty ruled Egypt for some 300 years, fusing Greek and ancient Egyptian cultures. The coins were found north of Qarun lake in Fayoum Oasis 50 miles (80 kilometers) southwest of Cairo. Other artifacts were unearthed in the area included three necklaces made of ostrich egg shell dated back to the 4th millennium B.C. and a pot of kohl eyeliner from the Ottoman Empire. The 383 items dating back more than 2,250 years were found near Lake Qarun in Fayum oasis, around 120 kilometers (75 miles) from Cairo, the ministry said in a statement, adding that they were in excellent condition. The coins weighed 32 grams (1.12 ounces) each, with one face depicting the god Amun and the other the words "king" and "Ptolemy III" in Greek along with his effigy, the statement said. Other objects from different periods were also found during the dig, in addition to parts of a whale skeleton around 42 million years old, it added. The ministry said it was the first time Egyptian archaeologists had found necklaces made from ostrich eggshell at Fayum. Zahi Hawass, secretary general of Egypt's Supreme Council of Antiquities, said Wednesday he had a wish list of objects he wants returned. He singled out several museums, including the St. Louis Art Museum, which he said has a 3,200-year-old mummy mask that was stolen before the museum acquired it. ``We're going to fight to get these unique artifacts back,'' Hawass said at the New York preview of the ``Tutankhamun and the Golden Age of the Pharaohs,'' an exhibition that has traveled to five other U.S. cities and London. With video of exhibitin preview. For the first time in more than three decades, King Tut is back in New York. And this time around, we know a lot more about the ancient boy king. It's the last stop of an eight-city tour, and this new Tut exhibit has already been seen by 7 million visitors. But curators say the New York stop, at the Discovery Times Square Exposition, features more new artifacts in a larger space, and they're promising you've never seen the boy king like this. King Tut, whose golden treasures last captivated New York and the world 31 years ago, has returned. And organizers of the exhibition "Tutankhamun and the Golden Age of the Pharaohs" are promising a show that's even bigger and better the second time around. "This one has 130 artifacts, 50 of which are from Tutankhamun," curator Dr. David Silverman said. "In actuality, they are two and a half times the size of last time." This show expands the historical horizon of the ground-breaking blockbuster that was Tut I by linking the king to his ancestors (and, incidentally, enshrining the now dominant spelling of his name). It also breaks with the museological origins of that first tour, which took shape under the oversight of Thomas Hoving, then director of the Metropolitan Museum of Art. For me, the press preview of the Tutankhamun and the Golden Age of the Pharaohs exhibition, which opened in New York today, was a momentous event because I've never met Dr. Zahi Hawass before, and I got to look him in the eye and shake his hand and even ask him a question. I'll come to all that in a minute. The exhibition is impressive. I can't deny that. There was a moment when I actually stopped dead in my tracks, mouth open (soon to be hustled out of the way by a pushy New York journo). This happened when I came upon a huge bust of Akhenaten, King Tut's autocratic probable Dad, high, high atop a great slab of honeyed stone, lit with a powerful spotlight, his face astonishingly realistic, the lips curved, cruel, sensual. I felt like Shelley's "traveler from an antique land" finding the ruined statue of King Ozymandias in the desert. Three reports from the 2010 season are new available at the above page (Field Report, Geophysical Survey and Palaeozoology). The excavations undertaken at the ancient city of Amheida (known as Trimithis in the Roman period) are a unique combination of archaeological fieldwork and educational program. Although primarily a modern, multidisciplinary excavation, the project also offers undergraduate students the opportunity for a study-abroad semester in Egypt that combines fieldwork with classroom study and visits to archaeological sites and museums. We make our ongoing work on site available internationally to both scholarly and public audiences via the web as well as through printed work. An article has appeared on a Spanish site which duplicates much of my eariler article showing that KV55 is probably not Akhenaten including extrapolition of the DNA to cover Nefertiti (although I am not credited); however the author comes to a different conclusion than me and opines that KV55 is Akhenaten. In coming to this conclusion it theorises that there was a genetic mutation between the two generations. Unfortunately the author, Juan de la Torre Suárez, President Andalusian Association of Egyptology doesn't cite any evidence for the frequency of mutation in the allele concerned. See the above page for more, including a link to the Spanish article. I've written up my notes from last Saturday's Coptic Thebes: Life in the 7th and 8th Centuries seminar by Dr Jennifer Cromwell (Lady Wallis Budge Junior Research Fellow in Egyptology at Oxford University) at the Egypt Exploration Society. You can find my notes on the above Coptic Heritage blog. It was an excellent seminar. In the four hours Dr Cromwell was able to paint a vivid portrait of many aspects of Coptic life on the west bank of Luxor. It is remarkable the extent to which the Coptic monks and settlers occupied Pharaonic temples and tombs on the west bank of Luxor. Perhaps even more remarkable is the extent to which so much evidence of this Coptic world was eliminated by excavators interested in the underlying Pharaonic levels. Dr Crowell talked about this remarkable landscape, the surviving evidence (both archaeological and textual), the clues to secular life in the village of Jeme (which occupied Medinet Habu) and the the practise of donating children to one monastery in particular. It was, needless to say, a day very well spent! Thanks very much to Jenny Cromwell for checking over my notes and picking up a couple of errors. I couldn't find this on any of the usual online retailers but perhaps it is not available just yet. I for one am interested in getting hold of this title so if anyone finds it available online please let me know. The origins of ancient Egyptian civilisation have been attracting the attention of archaeologist ever since the beginnings of Egyptology more than 200 years ago. This book presents a new and original interpretation of the rock art in Egyptian Western Desert which is of a key importance for our understanding of the roots of ancient Egyptian civilisation. Indeed, her very origins can be most likely dated to the 6th millennium B.C. In this time and the centuries to follow the paintings in the Cave of the Swimmers known from a blockbuster English Patient and in the Cave of Beasts discovered only few years ago were created. These caves are located in a distant and hardly accessible part of Egypt, on the border of Egypt, Libya and Sudan. The rock-art preserved in these caves features several unique motifs that will become cornerstone of ancient Egyptian iconography and mythology. Among them may be named the motif of the sky goddess and the earth god, prototypic representation of an ancient chieftain in the much later pharaonic guise or the concept of cave creatures protecting the entrance to the Netherworld. During the Fifth and Fourth millennia B.C. the vast areas of Western Desert suffered from a major depredation of climate that most likely caused a gradual evacuation of the region and instigated appearance of permanent settlements in the Nile valley which led to genesis of ancient Egyptian culture. The present study aims to present a theory according to which at least some parts of the discussed rock art in the Western Desert was created by an ancient mind that later on contributed to the intellectual emergence of ancient Egyptian civilisation in the Nile valley. Paris, April 21st, 2010 – Dassault Systèmes (DS) (Euronext Paris: #13065, DSY.PA), a world leader in 3D software solutions and the Museum of Fine Arts, Boston (MFA), one of the world's most important encyclopedic art museums, today announced that they will join forces in a strategic innovation partnership to bring the power of industrial and experiential 3D to the domain of archaeology. The Giza Archives Project is a digital initiative, housed at the Museum of Fine Arts, Boston, and supported by the Andrew W. Mellon Foundation. It is supervised by Egyptologist Peter Der Manuelian, the MFA's Giza Archives Director and Philip J. King Professor of Egyptology at Harvard University. The Project aims to “assemble and link” the world’s archaeological information on the Egyptian Pyramids at the Giza Plateau. In the last decade, it has digitized historic expedition photographs, excavation diaries and field notebooks, maps, plans and sketches from the ancient tombs and pyramids at Giza. The result is the largest database and Web site ever assembled relating to the Giza Plateau (www.mfa.org/giza). Most of the archaeological documents and photographs had been assembled over forty years of excavation by Egyptologist George Reisner (1867–1942), one of the prominent founding fathers of modern scientific archaeology who led the Harvard University-Boston Museum of Fine Arts Expedition in Egypt. In a unique international collaboration, the Giza Archives Project partners today with all of the world's institutions that house major collections related to Giza. Before going to the press preview this morning for Tutankhamun and the Golden Age of the Pharoahs, which will open at the Discovery Center Times Square on Friday, I had never seen Zahi Hawass in action. But now I know why Hawass, the Secretary General of Egypt's Supreme Council of Antiquities, has been so good at elevating the profile of Egyptian antiquities, claiming and repatriating artifacts from Western museums, raising money for archaeology and museums in Egypt, getting very good press in the process, etc. Too good, sometimes. He's a charmer, story-teller, teaser and advocate par excellence. Relating a tale about flying back to Cairo on Egypt Air with a coffin recovered with the help of Homeland Security officials here, he said a woman near him, learning that the coffin was in the plane's cargo area, got the willies. "Don't worry," he told her, "If there had been a curse, I'd have taken Lufthansa." Forget what you think you know about Cleopatra. She wasn't a voracious seductress who led men to their doom. She never wore bangs à la Liz Taylor circa 1963. And she almost certainly didn't die by the bite of an Egyptian snake. That's the premise of Duane W. Roller's Cleopatra: A Biography, a bare-bones approach to understanding the last ruler of the 270-year-old Ptolemaic dynasty and the only woman in classical antiquity who ruled with complete autonomy. If you're looking for romance-novel details of the Mark Anthony-Cleopatra VII affair, keep looking. Roller, a professor emeritus of Greek and Latin at the Ohio State University, makes it abundantly clear that his goal is to create a portrait of the infamous queen that is based "solely on information from the ancient world." That means forgoing all input from Shakespeare, Massenet and Hollywood. It makes for a somewhat dry read--navigating through Ptolemaic genealogies, recounts of political posturing with obscure satraps and discussions of ancient Roman land disputes won't keep the casual reader engaged. A collection of drawings and prints inspired by reliefs, monuments and sculpture in Luxor, Thebes and the Petrie's own collection in London. Many of the drawings and prints are inspired by the Hatshepshut Temple in Deir el-Bahri as well as the Luxor Museum. Around forty years ago, the Egyptian government approved sending 55 of some of the rarest artefacts belonging to the boy king Tutankhamun [to the Metropolitan Museum of Art in the US] that were discovered by the British archaeologist Hayward Carter on November 4, 1922. Even though this pharaoh ruled Egypt for less than nine years and died before he could prepare a tomb suitable for someone of his status in the same way his pharaonic ancestors did, over five thousand artefacts were found in his tomb and are still attracting the world’s attention and stealing the hearts of those who view them. Back to the story of King Tutankhamen’s first exhibition in the US, the artefacts were displayed at the Metropolitan Museum of Art, and despite that the museum made millions of dollars from donations to the museum and from the catalogues and souvenirs that were sold, Egypt made no financial profits from it. However, we cannot deny the tourist and promotional gains as a result of King Tut’s presence in the US. Now that we know all the facts, the exhibition of Tutankhamen is back once again in New York City after 40 years. This time, the wonders of King Tut will not be displayed at the Met but in a special display hall in New York. This is because the Metropolitan administration insisted it would not pay Egypt for the exhibition based on the pretext that entry to the museum is usually free, despite the fact that we know no one is allowed to enter the Met unless a donation is made and about other considerable financial profits as mentioned above. Sandro Vannini's Photography - Anubis Shrine and "Anubis Fetishes"
Anubis is the jackal-headed god for the afterlife and mummification, who is seen as a key figure for a Pharaoh to pass into the afterlife. The jackal was associated with associated with death and burials in Ancient Egyptian time for their reputation of scavenging human corpses and eating their flesh. It was common practice to place a figure of Anubis near the entrance of a tomb, and for the priest to don an Anubis mask during the embalming process. This is also one of the reasons the Anubis was selected to sail into New York's harbour to promote the upcoming King Tut exhibit! The Anubis Shrine and "Anubis Fetishes" are two artefacts found inside King Tut's tomb which honour the god, and are now held in the Egyptian Museum, Cairo where they have been photographed by Sandro Vannini. Brought online by Heritage Key, the beautiful details of both these fine artefacts can be appreciated from the comfort of your own computer! A spectacular 2,300-year-old collection of funerary objects from an Egyptian tomb will be the centerpiece of new Egyptian galleries that open May 8 at The Nelson-Atkins Museum of Art. Among the objects is an elaborately decorated, 7-foot inner coffin designed for an Egyptian noblewoman, Meretites. The new galleries give viewers a panoramic look at works created by artists and craftsmen in the ancient civilizations of the Near East, Egypt, Greece and Rome. The Meretites collection, acquired by the Museum in 2007, will be featured at the entrance of the new galleries. Members of the press are invited for an exclusive preview of the new galleries at 10 a.m. Friday, April 30. Eight priceless pieces of ancient Egyptian antiquities will be on display in Shanghai World Expo which will run from May 1 to Oct. 31, said Lotfy Abdel el-Hamied, head of the Foreign Exhibitions Committee in the Egyptian Museum. "The eight artifacts will be displayed in Shanghai Expo for six months," Abdel el-Hamied told Xinhua on Monday. He also asserted that the artifacts date back to different ancient pharaonic dynasties, adding that the oldest piece is the Gold Broad Collar of Ahhoptep with Hawak End-Pieces made in dynasty 18 (1550-1525 B.C.). "Ancient Egyptians thought that this Gold Broad Collar was protecting the mummies and helping them come back to life," Abdel el-Hamied said. Moreover, he said that the most charming one is the Gold Mask of Sheshonq which dates back to the 22nd dynasty (890 B.C.) and was found in 1939 in Tanis Royal Tombs in Delta, northern Cairo. Rock cut temple of Ramesses II, moved during Nubian Rescue Campaign. used as a Coptic church, which accounts for some of the damage. However, in spite of the Coptic usage colourful friezes still survive. The temple is often described as crude, but I found it to be charming. The deities above are, from left to right, Thoth, Ptah and Sekhmet. There is a plan of the site on the Tour Egypt website. A new tomb was discovered by an SCA mission at Tell el-Maskhuta in the Ismailia governate, announced Farouk Hosni, Minister of Culture. The tomb dates to the 19th Dynasty (1315-1201 BC), is constructed of mud brick and consists of a rectangular room with a domed ceiling made of stone, and a deep square-shaped shaft. The interior is decorated with scenes depicting the owner of the tomb, whose name was Ken-Amun. Dr. Zahi Hawass, Secretary General of the Supreme Council of Antiquities, reported that this is the first Ramesside tomb to be discovered in Lower Egypt. The tomb is very high quality, and is beautifully decorated and inscribed with scenes known from the Ramesside Period, added Dr. Hawass. In addition to this tomb, the excavation has found 35 tombs dated to the Roman Period. The excavation discovered a limestone stela inscribed with hieroglyphs containing the name of the capital of the Hyksos, Avaris (Het-Waret). The stela depicts the god Set in front of a king of Dynasty 19, whose name is not written. This stela shows the relationship between the site at Tell el-Maskhuta and the Hyksos capital Avaris, located at Tell el-Daba in Sharqiya. Dr. Mohamed Abdel Maqsud, the supervisor of the Department of Antiquities of Lower Egypt, said there was a large limestone sarcophagus found inside the tomb that belonged to the owner, Ken-Amun. He was the overseer of the royal records during the 19th Dynasty. The sarcophagus contained inscriptions on its inner and outer surfaces. The tomb walls were inscribed with the titles of the deceased and the name of his wife, Isis, who was a singer of the god Atum. The tomb is decorated in sunken relief with different religious and funerary scenes; the most important scenes were one from the Book of the Dead Chapter 125, as well as one of women mourning the dead. Other important scenes include a depiction of the goddess Hathor in the shape of a cow, emerging from the Delta marshes, as well as a scene of the four sons of Horus. 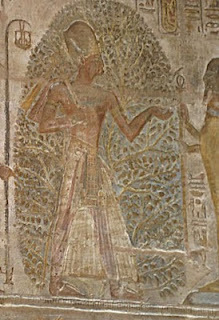 The scenes and titles in the tomb show that Ken-Amun was an important man, who was in charge of keeping the royal records. Ken-Amun's tomb is that first Ramesside tomb to be discovered in Lower Egypt and is built from mud brick, consisting of a rectangular room with a stone-domed ceiling. Hawass said the inscriptions would aid in the understanding of Egypt's relationships with its neighbors to the east. Inside the tomb, the walls are decorated with reliefs of funerary scenes, including Chapter 12 of the Book of Dead -- an ancient text intended to help the deceased in the afterlife -- and a scene of women mourning. The wall's inscriptions tell that the scribe's wife was called Isis and worked as a musician for the God Atum. A large limestone pillar also was discovered depicting the God Set, the god of darkness and chaos, in front of the 19th Dynasty king of the time, whose name was not written. On the same pillar, the name of the capital of the Hyksos -- an Asiatic people who invaded the eastern Nile Delta in the 12th Dynasty was found. Beautifully decorated, the tomb features scenes from the Book of the Dead, culminating with the famous vignettes from Chapter 125, which depict the critical judgment ceremony. Called "Weighing of the Heart," this symbolic judgment involved weighing and comparing the deceased’s heart to a feather of Maat, goddess of Justice, Truth and Order. If the heart is lighter than the feather, the deceased is judged worthy the company of the gods. If it fails, the heart is devoured by the crocodile-headed monster Ammit and the deceased is condemned to an existence between worlds. Other important scenes in the tomb include a depiction of the goddess Hathor in the shape of a cow, as she emerges from the Delta marshes, as well as a scene of the four sons of Horus -- Imsety, Duamutef, Hapi and Qebehsenuef. The toe of King Akhenaton, which was stolen in 1907 during an examination of the pharaoh's bones, was returned during a signing ceremony for an agreement with Switzerland over the return of ancient artefacts, the council said. "The toe is now back in Egypt and will be displayed in the Egyptian Museum in Cairo," said the statement, which confirmed that it was from the skeleton of the pharaoh, which had been found in the Valley of the Kings in Luxor. The toe's movements since 1907 were not disclosed. Frank Ruehli, a scientist at the University of Zurich and a specialist in mummies, obtained it "thanks to his personal contacts" in "another European country," a diplomat said without elaborating. The return was thanks to the Ruehli's "private initiative" and not carried out by the Swiss government, which is the 16th country to sign the accord on stolen antiquities, the diplomat added. The terminal phalanx of his great toe, probably from the left foot, was taken away in 1968, when the Department of Antiquities in Cairo, under the supervision of the then director, handed it over to the late Professor Ronald Harrison of Liverpool University. “Since then, the specimen has been held securely in my laboratory, but I decided it had to ‘go home,’ particularly since very few people knew where it was,” Robert Connolly senior lecturer in physical anthropology from the University of Liverpool's Department of Human Anatomy and Cell Biology, told Discovery News. . . . The toe has been returned safely to Egypt by Swiss anatomist and paleopathologist Frank Rühli, who personally handed it over to Dr. Zahi Hawass, the head of Egypt's Supreme Council of Antiquities, during a signing ceremony for an agreement with Switzerland over the return of ancient artifacts. A large new church, monastic burials and a vaulted room filled with Coptic wall paintings - new excavation work at the Monastery of Saint Apollo at Bawit is yielding a wealth of remarkable finds. One of the team members, Dr. Ramez Boutros of the University of Toronto, discussed some of the finds at a recent lecture and Heritage Key followed up with an interview. The Monastery of Saint Apollo was founded by the saint around 385-390 AD. It’s slightly north to the site of Asyut, which can be seen on the map below. Saint Apollo was a hermit of sorts who lived out in the desert. Dr. Boutros told me that fourth century Palestinian monks record that they met with him and that he was “already surrounded by a few disciples.” Two companions were particularly close to him - Phib and Anoup. With thanks to Tony Marson for sending the link. Video coverage of the recent Bahariya Graeco-Roman tomb discoveries. Two hundred years after the death of Rameses II, one of the greatest pharaohs of Egypt, his high priest Iufenamun decreed that his mummified body be moved to a secret location to keep his tomb safe from robbers. Now the priest’s own coffin, snatched from its last resting place, is to be displayed in public for the first time since he died 3,000 years ago. Inside is Iufenamun’s mummy and a cast of his face. These relics of one the world’s greatest civilizations have been uncovered among the collection of the Royal Museum of Scotland, Edinburgh, as its £46 million refurbishment continues. For conservators and curators, their encounter with the priest has been not only a professional challenge but almost a supernatural experience as the ancient remains of Iufenamun began to take human form again. It was all settled. CT scans revealed that Tutankhamun had a nasty leg fracture, and in 2007 Zahi Hawass, head of Egypt's Supreme Council of Antiquities, rendered his verdict: "He was not murdered as many people thought. He had an accident when he was hunting in the desert. Falling from a chariot made this fracture in his left leg and this really is in my opinion how he died." Septicemia (blood infection) or a fat embolism (release of fat into the blood stream) was to blame, and science had, through Hawass, spoken. Everyone duly recalibrated their images of Tut. Long dismissed as a minor, ineffectual child pharaoh, the "Boy King" was reimagined as an avid sportsman. Now, further analysis of Tut's CT scans, those of close relatives, and DNA studies may require another image makeover, thanks to results just published in the Journal of the American Medical Association (JAMA) by Hawass, Carsten Pusch (a DNA specialist from the University of Tübingen), and colleagues. But did the researchers get a little ahead of the evidence in some of their interpretations? 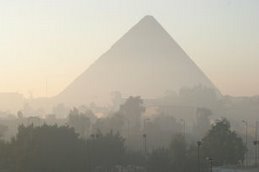 Egypt owns two thirds of the world’s monuments.” So says the government’s state information service. It doesn’t go into detail. But when you consider the abundance of national icons — the Pyramids, the Sphinx, Abu Simbel, the Valley of the Kings — that draw thousands of visitors every year, the richness of the country’s past can be overwhelming. It is precisely this illustrious history, in the form of exquisite relics, excavated ruins and secrets yet to be unearthed beneath the sands, that is the subject of a new amendment to the antiquities law that has caused much debate in the People’s Assembly (PA). Approved early last month after a year of discussion in Parliament, law 117/1983 is being amended in a bid to preserve the nation’s documented archeological heritage and prevent the expatriation of any future discoveries. Paul McKechnie, Philippe Guillaume (ed. ), Ptolemy II Philadelphus and His World. Mnemosyne Supplements 300. Leiden/Boston: Brill, 2008. Table of contents available at the above address. The volume offers the proceedings of a conference which took place in Auckland in July 2005, with two later additions, by S. Burstein and S. Pfeiffer. The topic chosen by Paul McKechnie and Bridget Buxton was strikingly new, as stressed in the preface: despite the importance of the character and the strategic leading position kept by Ptolemy II in the political chessboard of the second generation of Alexander's successors, no monographs have been dedicated to him until now. Moreover, as the title reminds us, Ptolemy Philadelphus was also the protagonist of the remarkable period of building up and developing that exceptional cultural centre which made Alexandria the capital of the Mediterranean for at least two centuries. The conference and consequently the proceedings were conceived under the sign of interdisciplinarity, as the editor McKechnie declares in the Introduction, the aim being to look for and find out the different "facets of the gem", Philadelphus's world, a paradigm of the multiculturalism which represented and included the main features of the Hellenistic world. The result of such an enterprise is uneven, though the intention of balancing the issues is well expressed by the subdivision into five chapters named by the districts of Alexandria, from Alpha to Epsilon. Egypt signed an agreement with Switzerland on Wednesday establishing tighter controls on the cross-border movement of cultural property and ancient artifacts. The deal will require both countries to ensure that stolen items are not imported and that stricter measures are enacted by customs officers to control the movement of goods. "Under the new rules, customs will check if [the item] has proper Egyptian papers, whether it was exported legally," said Benno Widmer, a legal expert at the Swiss Federal Office of Culture in Bern. Requiring an export certificate from the country of origin will make it harder to move stolen precious items across international borders. The measure follows a previous agreement reached several years ago between Bern and Cairo. The endless fascination with ancient Egyptian art and civilization during the revolutionary age of the "heretic" pharaoh Akhenaten (r. 1353-1335 B.C.) and Tutankhamun (r. 1332-1322 B.C.) continues to inspire the publication of quality color-illustrated studies. Suitable for scholars, students and enthusiasts, many are exhibition catalogues authored by respected museum curators, archaeologists and art historians. Most are available in bookstores and through Internet retailers. Now that “Tutankhamun and the Golden Age of the Pharaohs” is headed this way (opening Friday in the Times Square Discovery Center), it’s the perfect time to attend “Tutankhamun’s Funeral” a small but disproportionately powerful installation at the Metropolitan Museum of Art. Even people who aren’t keen on ancient Egypt, know that Tutankhamun’s tomb, which came to light in 1922, was the most intact royal cache ever recovered, a haul of solid gold objects, jewelry, clothing, furniture, weaponry, chariots and works of art. Today it fills 13 galleries in the Egyptian Museum in Cairo. The show has objects (embalming equipment, dishes and plates, water jugs, linen kerchiefs, floral collars and the remains of a meal) recovered in 1907 in a burial pit, not far from Tutankhamun’s tomb, which would not be discovered for another 15 years. Seattle is in for a bout of Tut-mania. The Pacific Science Center has announced details of a King Tut exhibit to coincide with the center's 50th anniversary in 2012. The exhibit headed to Seattle is "Tutankhamun: The Golden King and the Great Pharaohs." It features 50 artifacts from the tomb of the boy king, including the golden sandals placed on his mummified feet. It also includes the largest statue of Tut and dozens of artifacts from 2,000 years of Egyptian history. Pacific Science Center has been working for more than a year to land the prize, said board member Warren Buck, chancellor emeritus and physics professor at the University of Washington. The Egyptian Galleries in the British Museum are perhaps one of the most visited galleries. No wonder, the displays are just brilliant. Not surprised that Zahi Hawass, the Head of the Egyptian Antiquities Services goes into a catatonic apoplectic fits at the mere mention of the British Museum. So what do you see as you enter the gallery? You see perhaps one of the most famous stones in the world. the Nubia Museum in Aswan. Minister of Culture Farouq Hosni announced on April 12, 2010 the discovery of 14 Greco-Roman tombs dated back to 2,300 years at a construction site near al-Baweeti town in al-Baharia Oasis, October 6th Governorate. The archaeologists discovered four plaster human masks, a gold fragment decorated with the four sons of the god Horus, as well as coins, clay and glass, said Zahi Hawwas, the Secretary-General of the Supreme Council of Antiquities. A mummy of a woman measuring 97 centimeters, wearing some jewelry and covered with colored plaster depicting a Roman costume, was also found. The tombs were unearthed in an area where a youth center was to be built in a village there, Sabri Abdel-Aziz, the head of the ancient Egyptian antiquities department, said in a statement. The antiquities department has halted construction at the site, where a large necropolis may exist, he said. A bejeweled mummy dressed in Roman robes has emerged from the sands of Egypt's Bahariya Oasis, the Supreme Council of Antiquities said Monday. Entombed in a decorated gypsum sarcophagus, the 38-inch tall mummy belonged to a woman or girl who died in the Greco-Roman period about 2,300 years ago. Unearthed in a rock-hewn tomb at a modern construction site near the town of Bawiti, in Bahariya Oasis, some 185 miles southwest of Cairo, the mummy points to the existence of a large Greco-Roman necropolis nearby, Mahmoud Affifi, director of Cairo and Giza antiquities, said in a statement. Egyptian archaeologists unearthed a Roman mummy entombed in an elaborate sarcophagus at an ancient grave site alongside gypsum masks, the antiquities council said in a statement Monday. The one metre (three feet) long gypsum sarcophagus portrays a woman dressed in Roman robes and contains a mummified woman or girl who died in the Greco-Roman period about 2300 years ago. "We are sure (the mummy) is female. Either she was a small woman, and mummies always shrink, or she could have been a young woman," Zahi Hawass, chief of the Supreme Council of Antiquities, told AFP. Findings suggest that the tombs might have been part of a much larger necropolis, Egypt's Culture Ministry said in a Monday statement. The female mummy was found in the stair-lined interior of one of the rock-hewn tombs, Reuters reported. The 97-centemeter tall mummy was cast in colored plaster inlaid with jewelry and eyes. Archeologists also found four anthropoid plaster masks, a gold fragment adorned with engravings of the four sons of Horus and a collection of coins, and clay and glass vessels. The Egyptian government and the United Nations held the first workshop in their “Mobilization of the Dahshour World Heritage Site for Community Development” program on 10 April. The program aims to focus on developing the community while preserving the area's rich cultural and natural heritage. The workshop, held under the auspices of 6th of October Governor Fathy Saad at the famous Sakkara archaeological site, was attended by Spanish Ambassador to Egypt Antonio Lopez Martinez, and UN Resident Coordinator James W. Rawley. “I am confident that programs such as the Dahshour World Heritage Site for Community Development will succeed in improving the quality of life of the people of Dahshour while at the same time contributing to the preservation of the area's unique cultural heritage and biodiversity for future generations,” Rawley declared in an opening address. A step nearer to finding the land of Punt? Throughout their history the ancient Egyptians recorded making voyages to a place called the 'Land of Punt'. To the Egyptians it was a far-off source of exotic animals and valuable goods. From there they brought back perfumes, panther skins, electrum, and, yes, live baboons to keep as pets. The voyages started as early as the Old Kingdom, ca. 4,500 years ago, and continued until just after the collapse of the New Kingdom 3,000 years ago. Egyptologists have long argued about the location of Punt. The presence of perfumes suggests that it was located somewhere in Arabia, such as Yemen. However the depiction of a giraffe, at a temple built by Queen Hatshepsut, tells archaeologists that Punt is likely somewhere in Africa – perhaps around Ethiopia, Eritrea or Somalia. Meroë is one of the great kingdoms of ancient Sudan. Perched next to it was Egypt, another, great kingdom. For several centuries, especially the late period and during the reign of Cleopatra, Meroë was strategically positioned in terms of its geographical location, thus contributing to its reputation as a hub, or a melting pot, for several civilizations. However, till date, very little is known about this great civilization. An exhibition to enlighten the general public, on the vestiges of a great kingdom that hint on an atypical culture which could have influenced or been influenced by African, Greek, Roman and Egyptian civilizations is underway at the Louvre Museum in Paris until September. Meroë or Ethiopia ("The Land of Burned Faces"— as termed by Greco-Roman historians, or "The Kingdom of Kush" — as termed by ancient Egyptians) covered large areas within the confines of present day Egypt and Sudan, over 1000 kilometers along the banks of the Nile river for over six centuries. Egypt's Supreme Council of Antiquities is to expand, with the addition of a new department for archaeological collections. Among its duties will be the registration of privately owned artefacts, as well as supervising the transfers of ownership on these items. The Archaeological Collections Administration is established to facilitate the execution of the newly amended Antiquities Protection Law. The announcement comes only days after Egypt held its first conference on the repatriation of artefacts, showing that Egypt's focus is not just on retrieving looting antiquities from foreign collections, but mapping and saveguarding those 'at home' as well. Farouk Hosni, Egypt's Minister of Culture, announced the establishment of the first department for archaeological collections, the Archaeological Collections Administration (ACA), as a part of the Supreme Council of Antiquities (SCA). The new division will be responsible for determining the archaeological status of transferred individual or institutional collections in accordance with the recently amended Antiquities Protection Law. Those amendments lead to tougher punishments for theft and smuggling of ancient treasures, as well as cancelling the percentage of movable antiquities that were previously granted to 'outstanding' foreign excavation missions who discovered then. Roehrig, Catherine H. with René Dreyfus and Cathleen A. Keller (eds. ), et al. Hatshepsut: From Queen to Pharaoh (exh. cat.). New York and New Haven: The Metropolitan Museum of Art and Yale University Press, 2005. Queens seldom played decisive roles in the known course of antiquity. A handful distinguished themselves, sometimes due to their notoriety. Only recently has the skillful scholarship of art historians and archaeologists allowed their personalities to emerge and take their rightful places in the historical record. Nefertiti (ca. 1352-1336 B.C. ), the beguilingly beautiful consort of ancient Egypt's monotheistic "heretic pharaoh" Akhenaten, and the highly romanticized Cleopatra (r. 51-30 B.C.) number amongst these women. Not one distinguished herself for her accomplishments as did Hatshepsut. Indeed, in a time of relative peace and prosperity in Egypt, she fostered a cultural renaissance rarely seen in the ancient world. Hatshepsut: From Queen to Pharaoh is the catalogue published in conjunction with the popular special exhibition at the M.H. de Young Museum, The Metropolitan Museum of Art and the Kimbell Art Museum in 2005-06. An expert in forensic dentistry at the University of Connecticut School of Dental Medicine in Farmington said that Pa-Ib, the 4,000-year-old Egyptian mummy at the Barnum Museum, suffered greatly from dental disease in the last years of her life. But the expert, Dr. Alan G. Lurie, DDS, said that whether that was the actual cause of her death would be impossible to tell because of damage to the skull that was caused during the mummification process. But he said that she suffered from "very dangerous lesions" at the roots of the lower canines that can lead to infections of the sinuses, and ultimately, abscesses of the brain. Scientists in Germany and Switzerland have pioneered a new method of examining ancient mummies by using technology employed in airport body scanners. The pilot project, conducted at the University of Freiburg in south-western Germany, could revolutionise the way in which the secrets of mummies such as Egypt’s King Tutankhamun are unlocked in future. The low-level terahertz radiation used in new screening equipment currently being installed at airports around the world is particularly suited to scrutinising ancient tissue because it is far more gentle than X-ray scanning, the scientists said. Until now, researchers have resorted to X-raying mummies with CT scans, which can destroy DNA remnants because the rays can break apart molecules. A German museum confirmed Sunday plans to lend its greatest treasure, the seated statue of Hemiunu, to Egypt for the 2013 opening of the Grand Egyptian Museum at Giza near Cairo. Doubts over the loan cropped up after Zahi Hawass, the flamboyant chief of the Egyptian Supreme Council of Antiquities who visited Germany last month, called for the statue and other Pharaonic treasures to return to Egyptian permanently. Hemiunu is believed to have been the architect of the Great Pyramid of Cheops at Giza. The life-size statue, depicting him in nothing but a loin cloth, is the top draw at the Roman and Pelizaeus Museum in Hildesheim, Germany. Egypt’s top archaeologist Zahi Hawass is feeling good today, after the German museum housing a famous seated statue of Hemiunu has agreed to lend Egypt the statue for the 2013 opening of the Grand Egyptian Museum in Giza, near the pyramids. It continues Hawass’ push to have all Egyptian artifacts taken from the country returned to Egypt. This is just a loan, but a Supreme Council of Antiquities (SCA) official said that they fully expect Germany to allow the statue to remain in Egypt upon the end of the agreement. “We would not have agreed to only a loan if there were not discussions in the works that could see the statue return to its rightful home for good,” said the official, who was not authorized to speak to the media. The statue is one of the top pieces at the Roman and Pelizaeus Museum in Hildesheim and doubts over the weekend of the possible loan deal had emerged after Hawass, the outspoken and often controversial figure, had called for the statue and other ancient Egyptian pieces to be returned to Egypt permanently. The museum, however, did confirm they would loan the statue for the opening of the museum, but said upon the end of the deal, the statue would return to Germany. Downtown – Wust al Balad in Arabic – is Cairo’s 150-year-old central district. With its mix of Belle Époque, neo-Islamic and Art Deco apartment buildings, its roundabouts ornamented with statues, its glittering cafes and elegant shops, the area was once known as “Paris on the Nile”. But in recent decades the neighbourhood has lost its upper-class cachet, and its architecture has been damaged by misuse and neglect. It has become common to lament Downtown’s decline – in the press and in Egyptian literature, whose development is deeply linked to the area. Now private investors and government authorities are putting in motion plans to protect and renovate the neighbourhood. Karim Shafei fell in love with the area when he attended an art festival there in 2001. “I thought: Downtown is going to happen again, the same way it happened in Paris, New York, Istanbul,” he says. Shafei is the chief executive of Al Ismaelia Company for Real Estate Investments, a new venture that is dedicated to buying and renovating Downtown properties – and possibly returning the area to its glory days. Gabriel opens with a short, but concise introduction to Egyptian history to set Thutmose's life and campaigns within the framework of the political, economic, diplomatic, and, of course, military practice of his times.